Daily skin maintenance helps manage acne. At times, your skin begins to build a tolerance for acne medication, so adding an occasional intense treatment for the skin can help heal existing acne faster. Will Dermaquest Acne TX Mask be the best acne treatment? We need to take a closer look at the ingredients and consumer reviews before we can make that determination. The Dermaquest Acne TX Mask is a home treatment for a deep cleanse that purifies the skin in order to erase acne and shield the skin.This mask exfoliates the skin with jojoba beads. Jojoba beads gently exfoliate the skin to remove pore clogging impurities without irritating skin further or aggravating existing acne. Once the skin is exfoliated, the pores are more susceptible to the 2.5% benzoyl peroxide. The benzoyl peroxide penetrates the skin to kill acne-causing bacteria and removes excess oil from the skin.Other beneficial ingredients in the mask include white willow bark and MSM. These additions have antiseptic and anti-inflammatory properties to help cleanse the skin and reduce redness.The Dermaquest Acne TX Mask is best for acne-prone and oily skin. This mask is not really for daily use. The mask has to be massaged into the skin and left on for 5-10 minutes while it works magic.Some of the minor side effects associated with the mask include redness, dry skin, and skin irritation. The best way to avoid these potential side effects is to have a post-mask moisturizer or post-mask regimen. 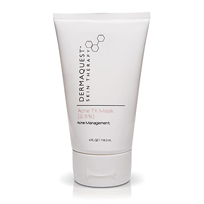 Using a mask like the Dermaquest Acne TX Mask is an periodic treatment for acne. The mask should accelerate the natural healing process. Using a ten minute mask daily can be inconvenient, so for a daily remedy consider alternative treatments that utilize 2.5% benzoyl peroxide as well.